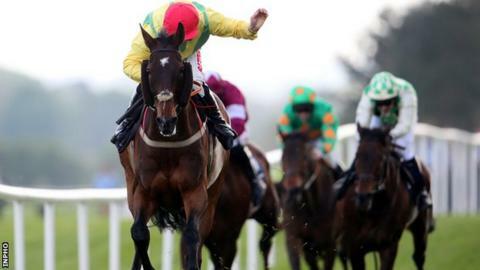 Sizing Europe won the Boylesports.com Champion Chase for a second time at Punchestown on Tuesday. The 12-year-old was always travelling well as he repeated his 2012 success, registering an eighth Grade One win for his trainer Henry de Bromhead. Leading before the second-last fence under Andrew Lynch, Sizing Europe (7-1) went on to deny Ballynagour by five and a half lengths, with Savello third. Owner Alan Potts said Sizing Europe will now be retired. There was drama down the back straight where the favourite Hidden Cyclone fell and hampered Module, who was immediately pulled up. Potts told At The Races: "Fantastic. I could see him winning because there was nothing in that race that had beaten us. Somersby beat us once. We beat him the rest of the times. "Somersby obviously didn't run the race he could, but Europe was back to his brilliant best." When asked if Sizing Europe would be retired after what was an emotional triumph, Potts answered: "Yes." De Bromhead said: "He is just unbelievable, he was running away with Andrew. He was just loving it. I'm speechless." Sizing Europe was winning for the 21st time from 42 career starts, his first success under Rules coming in a bumper at Naas in 2006. Also top class over the smaller obstacles, he landed the Irish Champion Hurdle in 2008 by eight lengths from Hardy Eustace. As a novice chaser Sizing Europe claimed the Arkle at Cheltenham in 2010, beating Somersby, and returned the following year to lift the Queen Mother Champion Chase crown. Sizing Europe's success was the highlight of the first day of the Irish National Hunt Festival at the County Kildare track.